OSOD has extensive expertise in providing sensitive electrophysiological tests of visual function within specific levels of the visual system. These tests permit repeated assessment of function at multiple time-points prior to histological analysis of tissue structure and are widely used in safety and efficacy studies. Electrophysiologic studies are designed, executed, and analyzed under the supervision of Dr. James ver Hoeve, PhD, the Director of Electrodiagnostic Services in the Department of Ophthalmology at the University of Wisconsin-Madison School of Medicine & Public Health. All testing adheres to the recommended guidelines set forth by the International Society for the Clinical Electrophysiology of Vision (ISCEV). Traditional testing (ffERG, PERG, and VEP) is performed with a UTAS-E 2000 or UTAS E-4000 visual electrophysiology system and pattern stimulator. mfERG testing is performed with a VERIS 4.9 multifocal system. See our range of electrophysiology and electrodiagnostic services below. The ffERG measures widespread alteration of the functional integrity of the outer layer of the retina including photoreceptors and bipolar cells. The ffERG is not sensitive to selective loss of the retinal ganglion cell layer, optic nerve, or local retinal lesions. The ffERG, however, is often altered by drugs, diseases, ischemia, or procedures that diffusely affect cellular functions. Small contact lens electrodes are placed on the cornea and the retina is stimulated by light delivered within a sphere, or Ganzfeld. The electrical potentials generated by photoreceptors and bipolar cells are measured and recorded. 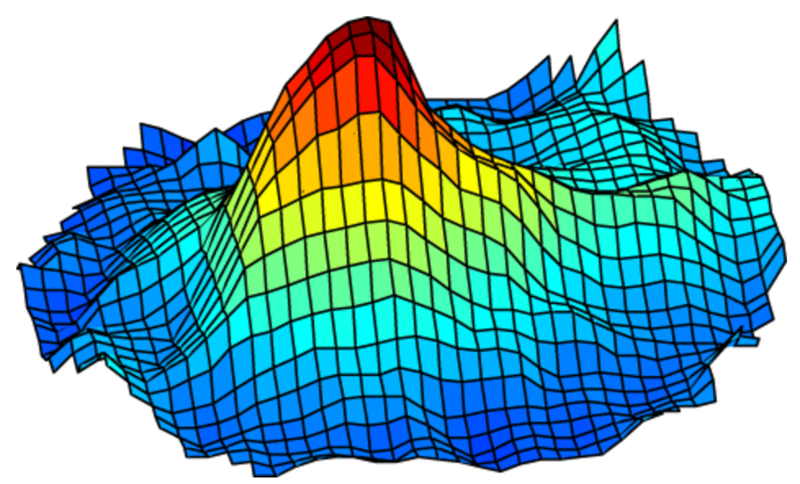 A standard ERG measures five retinal responses by isolating rod (scotopic) and cone (photopic) circuits following dark and light adaptation. ffERG testing can accelerate drug development by providing information about retinal function that may not be detected on structural examination. Ocular compounds move more quickly through the FDA approval process if preclinical electrophysiologic data demonstrate no negative effects. OSOD is skilled in the development of specialized ffERG protocols to meet specific species or development goals. The multifocal electroretinogram (mfERG) simultaneously provides photic stimulation and measures bioelectrical signals from multiple discrete regions across the retina. It is used to evaluate discrete functions across large areas of the retina and to diagnose and study retinal diseases. It uses the same electrodes and amplifiers as conventional ffERG recording, and provides a topographical measure of retinal activity that can be compared with the human patient's visual fields. The mfERG has helped neuro-ophthalmologists distinguish between diseases of the outer retina (affecting photoreceptors and/or bipolar cells) and diseases of the inner retina (ganglion cells) and optic nerve. Because the mfERG shows good repeat reliability, it can be used to follow the progression of retinal diseases. When combined with automated perimetry, the mfERG is a valuable tool for localization and differential diagnosis. When combined with mfVEP, mfERG can differentiate between organic and nonorganic causes of visual loss. In animals, it provides an objective measure of retinal function across multiple discrete regions. It is particularly relevant to the study of macular function in non-human primates and the assesment of focal effects of gene and cell delivery to the back of the eye in all species. The pattern electroretinogram (pERG) measures retinal ganglion cell activity, estimates retinal function, and quantifies the retinal response to light stimulation. 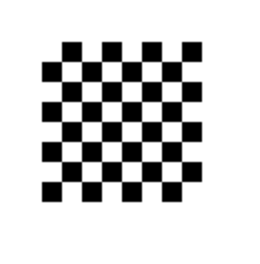 A reversing checkerboard stimulus or contrast modulated grating pattern is used with no change in overall luminance over time (space-averaged luminance). Electrodes detect and sum responses from the electrical potentials originating from the retinal ganglion cells. Retinal ganglion cell damage is the underlying cause of glaucoma-related decreases in visual sensitivity. Therefore, the pERG is uniquely useful for detecting and monitoring this disease. 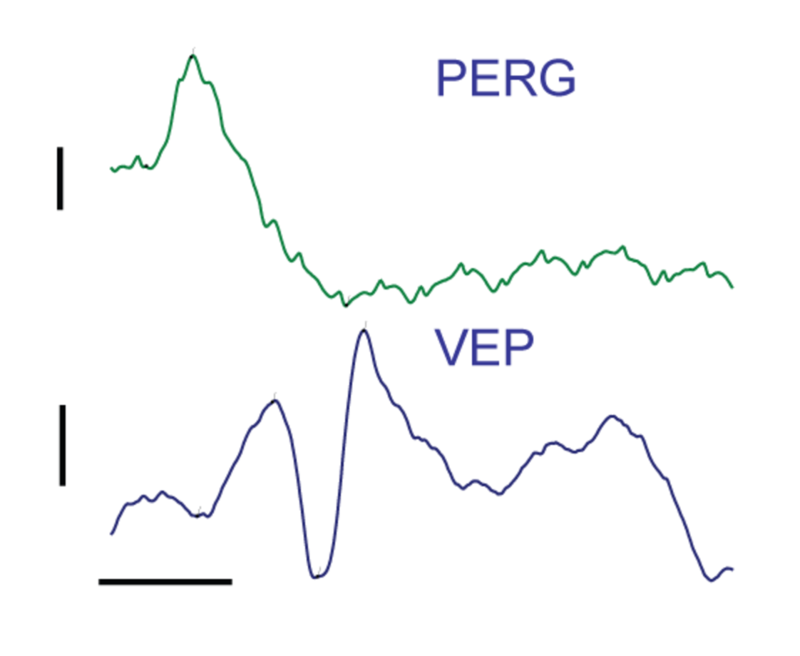 A visual evoked potential (VEP) measures the time it takes for the neural connectivity between the eyes and brain to respond, and the strength of the response when the eyes are stimulated by a flashing light or test pattern. The pattern reversal VEP can be used as an objective measure of visual acuity. Electrical responses can be recorded from the primary or secondary visual cortex using conducting gel and electrodes taped to the appropriate areas of the scalp. Cortical electrical activity can estimate central processing function. Abnormal response times can be associated with neurological diseases or damage to the optic nerve and visual pathways. Assessment of visual evoked potentials can help to prevent blindness and other forms of vision loss that may occur as a result of optic nerve damage. If you have any questions about our electrodiagnostic services, do not hesitate to CONTACT US.